Pursue a Brighter Future with an online health care program degree! Are you ready to begin – or advance – a career in health care? Online nursing degrees from a health care program from Grantham University’s College of Nursing and Allied Health can help. "Healthcare occupations are projected to grow 19% between 2014 and 2024, adding more than 2 million new jobs to the industry." From working parents to military veterans, Grantham University’s certificate, undergraduate and graduate degree programs are a great fit for adult learners ready to pursue a career in healthcare. 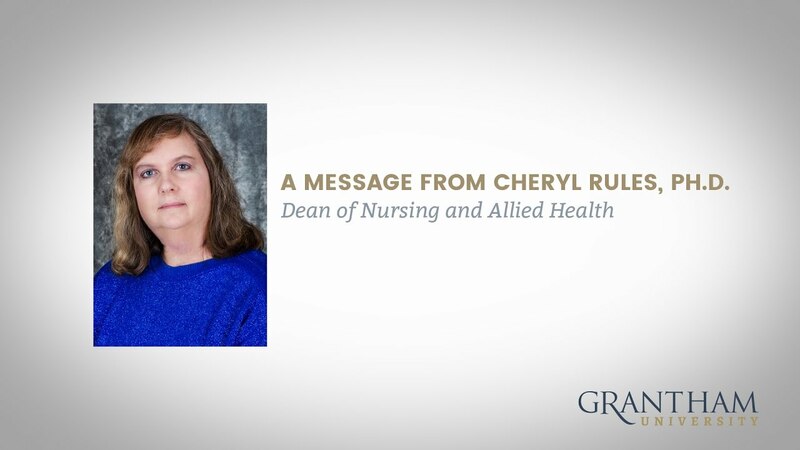 Message from the Dean Cheryl Rules, Ph.D.
Hello. My name is Dr. Cheryl Rules. I’m the Dean of the College of Nursing & Allied Health. Thank you for considering Grantham University as your educational partner. We specialize in helping adult learners like you achieve their degree dreams through online education. Our online nursing degrees, expert faculty and proactive support systems will help you succeed as you return to school. In fact, we promise to do everything we can to help you succeed as your pursue your education. Take, for example, our innovative VIP Squared program: We will be Visible – actively engaging with you each week. We will be Immediate – responding to questions, issues or assignments within 48 hours. We will be Personal – offering live office hours. And we will be Proactive – posting course policies and contact information day one. I hope to see you in one of our online classrooms … and I look forward to helping you achieve your educational goals. Grantham University prepares healthcare professionals in nursing and allied health careers to expand their knowledge and skills in areas of leadership, community concepts, research and evidence-based practice related to current trends and issues in today’s global society. The School of Nursing is a candidate for accreditation by the Accreditation Commission for Education in Nursing (ACEN).